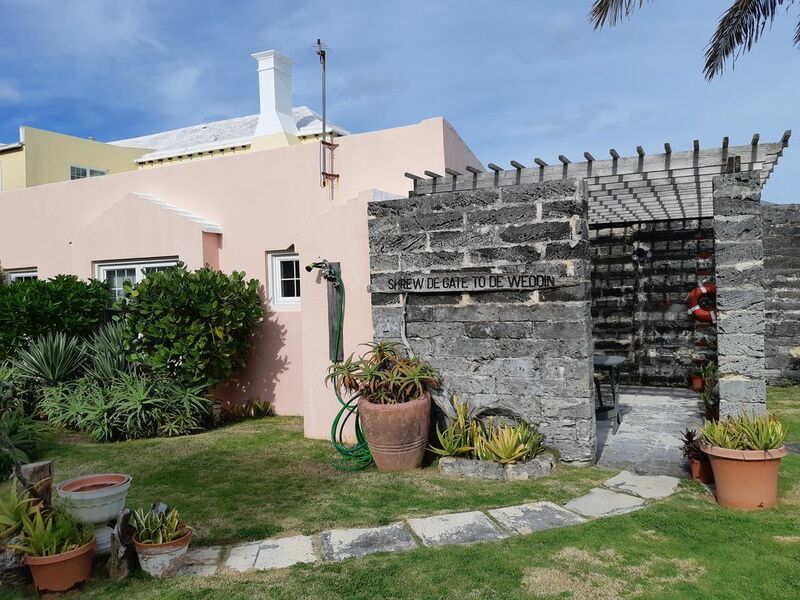 Less than ten minutes travel from the airport it is located in the very center of St. Georges, the original capital of Bermuda, can be found a quaint one bedroom garden cottage with views of the harbor, only seconds away from shops, bars and restaurants. This fully modernized cottage sleeps two, fully air-conditioned and heated in both rooms, plenty of closet space with a washer and dryer, and a comfortable king size bed. The open planned kitchen and lounge gives you views of the garden and harbour and is fully equipped with cooker, refrigerator, microwave and toaster, a small dinning area, TV with free cable and WI FI in the lounge. Enjoy sitting on the patio or on the dock in the shared garden taking in Bermuda's beauty or walk around St. Georges and visit it's historical sites and museums. Only a twenty minute walk or three minute drive to Tobacco Bay and Fort St. Catherine Beach. To venture out of St. Georges we have the bus and ferry stops only minutes away from your door. It is a non-smoking building and children over 18 welcome. A quaint cottage to enjoy your time in Bermuda in a waterfront and garden setting in the heart of the Old Town of St.Georges. Great apartment within historic Smith House right on the waterfront. The large covered and nicely furnished balcony/deck overlooks the lovely resort-like grounds and harbor. Several excellent waterfront restaurants are walkable in less than five minutes. After a day of beaching/exploring the islands, coming back, getting cleaned up and then walking to dinner is a huge benefit. St. Georges has a number of historic sites and several beaches within a 15 minute walk. The public ferry dock is a five minute walk and buses are easy to access as well. Our favorite aspect of the apartment was the balcony. We spent mornings out there with breakfast and books, and evenings just relaxing before and after dinner. Linda was a terrific host and an excellent source of advice and assistance. I discovered I had left my wallet in a taxi an hour after the fact and Linda made a couple phone calls and I had my wallet returned in tact an hour later. This was our first trip to Bermuda and we won't hesitate to stay here again. Beautiful beaches, quaint towns and a very safe feeling environment. Skip the over-priced resorts and big hotels; stay here-you'll be glad you did. We would give Smith Cottage six stars if possible. It is a private location right in the middle of St. Georges, a historical UNESCO site . It is five minutes from the ferry terminal and bus stop that provides transportation to the whole island. The cottage is very well equipped with amenities and clean. One block away is Kings Square that is the center of activity with restaurants and entertainment. Linda, the owner/manager, takes very good care of her guests to make sure they enjoy their stay. We highly recommend staying there and hope to return. A lovely stay at the perfect location! This quaint little cottage is tucked away with a private entrance and a beautiful view, while also a very short walk to all the sights in St. Georges. You can relax on the patio overlooking the harbor, and then easily explore the shops and restaurants just around the corner. Wahoo's Pub is a lively little place for lunch, dinner or cocktails. And for a nice dinner, we highly recommend The Tempest Bistro and The Wharf. All are right on Water Street and literally a 2-minute walk from the door of the cottage. Also very nearby are King's Square and St. Peter's church. Be sure to check out Kelly's Sea Glass shop for some beautiful hand-made items, just a short walk up Water Street. This was our first trip to Bermuda and Linda was the perfect host and so helpful. We thoroughly enjoyed our stay! Wonderful way to spend our honeymoon! The second part of our honeymoon in Bermuda was spent at the Smith Cottage. We are so glad we split up our trip. We began our holiday in Southampton, so we explored the southern part of the island, and then headed up to St. George for the second part of our trip. St. Georges is a super cute and friendly town. The Smith Cottage is SMACK in the middle of the old downtown and right on the water. It was just PERFECT. We adored waking up and being right on the water and having our own private patio to enjoy, and the location was also FANTASTIC for evenings because we could walk to EVERYTHING (shops, restaurants, bar, pharmacy, grocery store, etc.) Not to mention that Linda & Chris are fantastic hosts. The cottage is set up with everything you need, and having a kitchen to cook some meals really helped our budget out. I cannot say enough about the location – right on the water, close to the action, and can walk to everything. What more do you need?!? This was a lovely spacious 2 bedroom apartment. Everything was very comfortable and clean. It is right in the heart of town and with a view of the ocean . What more could you ask for ! We walked to all the shops, restaurants and to two beaches. The bus is only blocks away as well as the scooter /cycle shop. Linda was a joy to work with and was a pleasure to meet. Wonderful Cottage in a Great Location! We just celebrated our 25th anniversary at this unique and special cottage. It was everything we hoped and more. The beaches in the area are fantastic, beautiful sand and snorkelling. We walked to the beach everyday - Tobacco Bay is maybe a 10 minute walk . Location of the cottage is perfect, nice privacy in the yard with a beautiful succulent garden, but right in the heart of the old town of St.George. Steps away from a number of restaurants, grocery store, bus stop, visitor centre, ferry, post office, museums, town square and bike rentals. Many places to explore in the area and also easy to get to other areas of Bermuda. The cottage was very well equipped. Linda was awesome and very helpful to get us oriented. Can't wait for our return visit!! Thanks Linda for making our stay special! St. Georges is a World Heritage Centre with wonderful historical fortifications within walking distance, fabulous pink beaches where you can relax, snorkel or swim. Relax with the locals in the Town Hall and Square where you can watch the dunking of the local gossip in the harbor. A ferry ride to Royal Naval Dockyard, a must see The Commissioners House and the Dolphins.